Want to quickly see how the open-source software AIOCP (All in One Control Panel) works? You'll find a free and updated demo installation of AIOCP (All in One Control Panel) here. 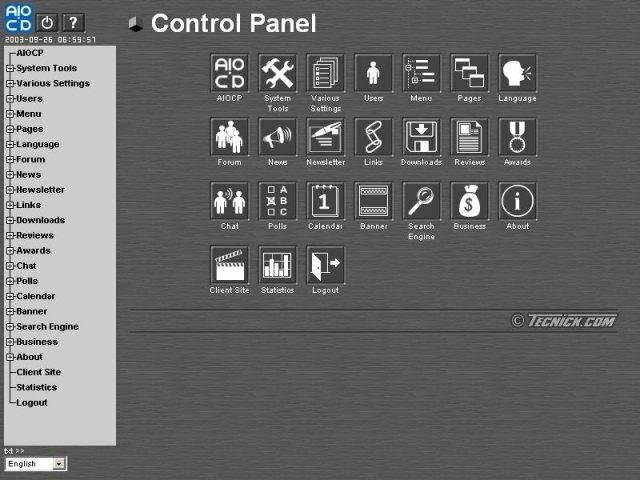 We are currently updating the AIOCP (All in One Control Panel) demo. Please check back shortly. There will be a new version up soon. AIOCP CMS is a free open source content management system developed using PHP as a programming language and a MySQL database. The abbreviation stands for All In One Control Panel. It was used for creating any type of website, from individual small sites to intranet portals. Looking at a AIOCP CMS demo you’ll see it also offers a variety of modules that extend its features, like ecommerce, e-business and development framework. You can download it using the link below, but make sure you do not use it in production environment. If you want to see how a AIOCP CMS demo looks like you can have a look at the screenshots.